Historically called the Pueblo of Cicuique, here the Pecos Indians once commanded the trade path between Pueblo farmers of the Rio Grande and hunting tribes of the buffalo plains. 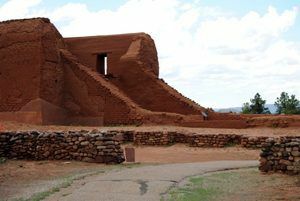 The first Pecos Pueblo was comprised of about two dozen rock-and-mud villages built in the Pecos River Valley around 1100 A.D. About 350 years later, the village had grown to house more than 2,000 people in a five-storied complex. The Pecos Indians were an advanced tribe with a heritage deeply rooted in the Puebloan culture of the American Southwest. Like their Ancient Puebloan ancestors, the Pecos practiced ancient customs in agriculture, religion, and architecture. Farming was essential to their livelihood. By applying an ancient agricultural technique that had originated in Mexico, the people of Pecos were able to supply most of their diet of corn, beans, and squash. Farming influenced the architectural design of the Pecos village, as the Indians built storerooms to set aside food for the winter and constructed dams to regulate the water that flowed to their crops. Their impressive architecture also included large multi-story houses built above the storerooms using adobe bricks. To protect the village, the Pecos erected a large wall, which according to one Spanish conquistador, was visible from a far distance. Some of their most impressive structures were the kivas, subterranean pit-houses used for religious and ceremonial purposes. Although they varied in shape and size, they were traditionally circular with a hole in the floor. 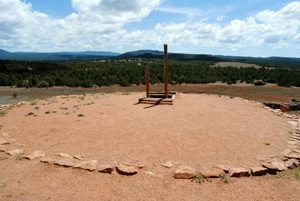 The hole in the ground represented the connection to the underworld, which the Pecos and other Pueblo tribes believed was their people’s place of origin. The Pecos routinely prayed to the underworld through ceremonies and brought offerings to the spirits to receive good fortune. They feared that failing to perform these rituals would upset the spirits, which in turn would cause their crops to die and their overall world to become unbalanced. Though neighboring pueblos saw the Pecos as dominant, warfare between Pueblo groups was common. In addition, the frontier people of Pecos had to be vigilant with nomadic Plains Indians, who were often unpredictable. At trade fairs, Plains tribes, mostly nomadic Apache, brought slaves, buffalo hides, flint, and shells to trade for pottery, crops, textiles, and turquoise with the Pecos River Pueblos. By the late Pueblo period, the last few centuries before the Spaniards arrived in the Southwest, people in this valley had congregated in multi-storied towns overlooking the streams and fields that nourished their crops. In the 1400s, these groups gathered into Pecos Pueblo, which became a regional power. The Spaniards would soon learn that the Pecos could be powerful allies or determined enemies. In 1540, the Pecos people would first encounter the Spanish strangers when Francisco Vasquez de Coronado, leading an army of more than 1,200 men, traveled to New Spain’s northern frontier in search of the legendary seven cities of gold, referred to as Cibola. Six months into the march he rode into a cluster of Zuni pueblos near present-day Gallup, New Mexico. He attacked the Zuni at Hawikuh, taking over that principal town and its food stores for his famished soldiers. When Coronado and his men reached the village of Cicuye, which would be called “Pecos” by the Spanish, 150 miles east, the reception was different. The Indians welcomed the Spaniards with music and gifts. There, a Plains Indian captive told of a rich land to the northeast called Quivira. In the spring of 1541, Coronado and his men set out in search of Quivira, wandering as far as Kansas. After finding only a few Indian villages, his Indian guide confessed that he had lured the army on to the plains to die, and Coronado had him strangled. Having failed to find Cibola, Coronado and his men turned back and returned to Mexico empty-handed and the Pecos Indians settled back into their old ways. 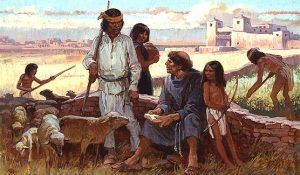 Although Coronado’s expedition failed, the Spanish were still determined to colonize the Pueblo lands and convert the American Indians to Christianity. In 1598, Don Juan de Onate, along with settlers, livestock, and 10 Franciscans crossed the Rio Grand and marched north to claim the land for Spain. Right away he assigned a friar to the Pecos pueblo the richest and most powerful New Mexico. But these early Spanish missionaries failed and after episodes of idol-smashing provoked Indian resentment, the Franciscans sent veteran missionary Fray Andrés Juárez to Pecos in 1621 as a healer and builder. Under his direction, the Pecos built an adobe church south of the pueblo. The most imposing of New Mexico’s mission churches, it included towers, buttresses, and great pine-log beams that were hauled from the mountains. The ministry of Fray Juárez from 1621 to 1634 coincided with the most energetic mission period in New Mexico, which had become a royal colony.